Did you ever notice that the three levels of bô jutsu from the kukishin represented the three levels of the ten chi jin? Did you ever notice that in the shoden no kata you had 3 groups of 3 techniques? 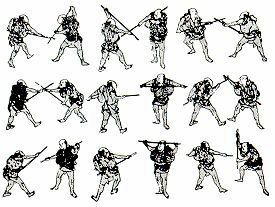 Each name of technique begins with the name of a kamae followed by the principle hidden within each one of the groups. Those principles can be written in different ways, I offer here three possible meanings. The second group is gogi and can have the meaning of go(shin), “defense”. Go (護). The third group is kôki and can have the meaning of “achievement, success”. Kô (功). If we add those three meanings we get the idea the the first level of the kukishin bô is to develop our intuition to defend ourselves in order to find success”. Funnily, the last technique (the ninth) of the level look like a mix of all the waza studied in the level. If not in the form at least in the feeling. Previous Post Sticks Up Today!